Photo above taken last Monday, January 1st in Tucson, Arizona. 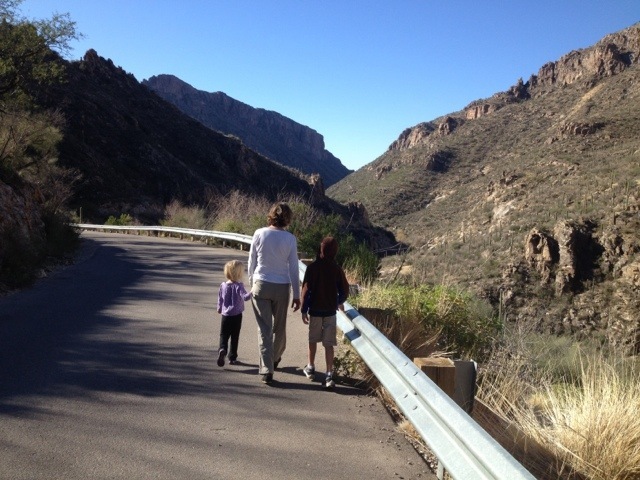 A family walk through Sabino Canyon with Grandma, Grandpa, me and the kids. After nine days in sunny, warm Arizona and two weeks off of school, we are back in balmy Minnesota (it has been record highs lately making me wonder what month it truly is) and off to another new year. The kids are back in school. My son started today and my daughter will resume preschool tomorrow. The weather has been uncanny and odd. It reached 50 degrees today, we have absolutely no snow and for the first time I can ever remember, the lake is not frozen solid. Either we are in for some serious payback in February or global warming has landed hard. Today was unseasonably warm, a high of 50 degrees (normally it is in the teens and that is considered warm). 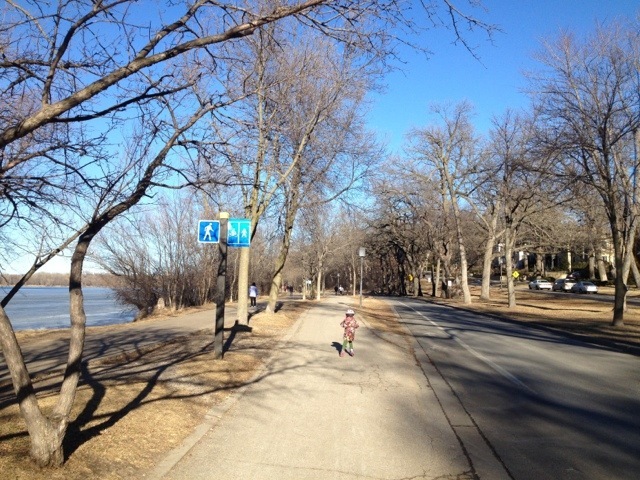 My daughter and I went down to the lake where she rode her scooter, unbelievable for January! There is no snow (last year we had a few feet by now and 82 inches by the end of the season). 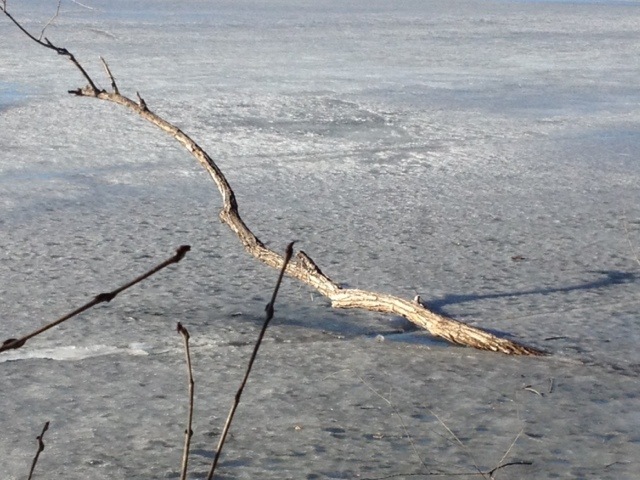 And, as you can see on the picture below, the lake is not completely frozen! There is a huge hole in the middle! 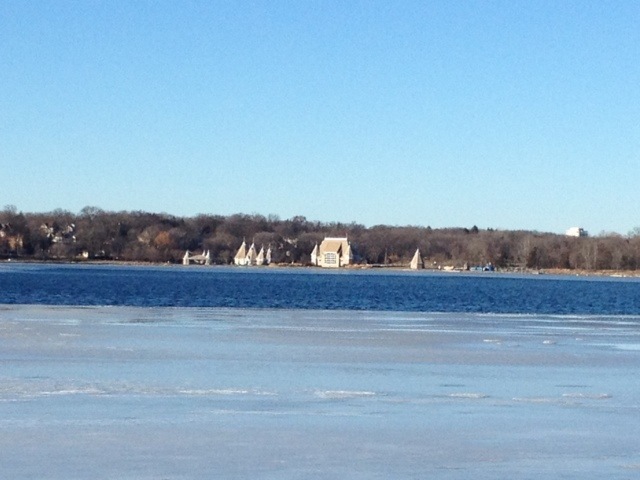 Normally Lake Harriet and the other metro lakes are frozen solid by early December. The ice is so thick that cars, yes that is correct, can drive across them and ice fisherman drill their holes into the ice and set up their ice homes across Minnesota lakes. There are skaters, nordic skiers and snowshoers galore. Not this year! At least not yet. The odd weather has left me confused and thinking that the Gods Must be Crazy! But as I know, having lived in Minnesota and the Midwest for almost all of my life, that I don’t have to worry one bit. Winter will come, and when it does decide to show up, it will be long, brutal and cold. For Minnesota is notorious for harsh, long winters. That is what makes us Minnesotans such hearty souls. As I get back into my daily routines, it is time for me to start focusing on 2012 and all the exciting things coming ahead. Tomorrow, my post on my upcoming involvement with the UN Foundation’s pilot program, Shot@Life will be posted on World Mom’s Blog (I will add a link tomorrow on my blog). At the end of the month, I’m headed to DC to be trained as a grassroots advocate for this exciting program that focuses on providing immunizations to millions of children in developing countries. After that, the fun begins with blogging and hosting events to raise awareness of the dire straits of children around the world who don’t have access to life-saving vaccines. In February, my daughter and I are going on a big ski trip out west to Taos, New Mexico to meet up with my dad. Both of my children have been learning how to ski this winter and we’ve spent every weekend at the ski hill (except of course when we were in Arizona). It has been a wonderful way to be together as a family and to see my children learn to ski. I grew up skiing and love the sport. Thank goodness they have the equipment to make snow on the hills here! The balmy weather has been ideal for weekend skiing. In March, I am off on another adventure to volunteer and learn Spanish in Quetzaltenango, Guatemala. I’ve been dusting off my old spanish grammar books and have started my evening lessons at home reviewing, memorizing and praying that I will be able to communicate with the locals when I’m there! I have no idea what to expect but that is what will make the experience so fun. Other than that, who knows? I find that life is always an adventure and I look forward to what 2012 will bring. Stay tuned..my next series on China will be about the different neighborhoods of Shanghai. Then, I will take you on a trip to a nearby water village dating back hundreds of years. Thanks for reading and comments welcome! Sounds like it’s going to be a busy year, Nicole. About the weather, however–I wish we could blame this on God–but I’m afraid we may have done this to ourselves. Kind of a scary thought. I hope I’m wrong. Enjoy the warm weather while it lasts, my friend. Actually I was trying to make light of the situation as global warming freaks me out! I find it real, disturbing and somewhat irreversible. I truly hope the World govts change their policies! Has It been warm for you too! Good luck with the Spanish, Nicole! You can practice on me when you get to Antigua!